Red swamp crawfish Procambarus clarkii is native to north-eastern Mexico and the south-central USA, and it has been introduced worldwide becoming the most widespread crawfish in the world (Gherardi 2008, Tablado et al. 2010). The species was legally introduced by the central government in 1974 in the Bajo Guadalquivir rice fields for commercial reasons and its natural expansion was enhanced by fishers and promoted by the Spanish Government (Alcorlo et al. 2008) being today present throughout almost all the Iberian Peninsula. There is no evidence of scientific studies at that time assessing its possible impacts. Freshwater species are generally not considered as professional fishing resources in Spain; nevertheless the red swamp crawfish in the Guadalquivir Delta is an exception due to the socio-economic importance of the crawfish processing industry in Seville province grouped since 2011 in a single association (Pebagua). Fishing is only allowed only in the marshes and rice fields of 13 municipalities within the Guadalquivir Delta (Junta de Andalucía, 2014). Authorized fishers must be in possession of a a generalist recreational licence given by the Junta de Andalucía and they have to be registered as providers of one of the processing factories. Fishing in done on foot in the marshes, no boat is needed, instead fishers move by car setting and collecting the traps, and all the catches have to be sold to the processing factories. As most of the fishing in this area happens in rice fields or their irrigation channels, the fishing campaign is closely linked to the rice culture cycle; on an average year rice fields are flooded in May and by the end of September the water level starts descending, so the rice can be finally harvested in October. The red swamp crawfish fishing season lasts approximately for three months, starting in August and finishing in October-November. In 2013 there were 419 registered fishers in Andalusia, and the four factories grouped under a single processor’s association (Pebagua) processed 4,600 tons of crawfish (3,000 tons caught in Andalusia) (Pebagua, personal communication). Spain is the 3rd largest producer of P. clarkii in the world after China and the USA, selling 8-10% of the world commerce. For the last decades the red swamp crawfish fishery and its associated food industry has become a thriving socio-economic sector in the Guadalquivir Delta. There are enough elements to potentially allow for a well-managed fishery which can ensure a sustainable use of the target species and associated ecosystems: a restricted fishing area and other spatial measures already in place to minimize the impact of the target species on habitats and ecosystems, a surrounding area where ecosystem functions and biodiversity are protected through a representative network of protected areas, and an organized and responsible food industry. It is unlikely that there is a significant risk of overfishing as the red crawfish is known to be an abundant resource in the area. So far, most of the policies were focused on deterring the expansion of the red swamp crawfish and the scientific studies were focused on studying the effects of this species on the ecosystems. Meanwhile, little attention has been drawn to improve the fisheries management. There is a legal vacuum regarding the regulation of this fishery (professional inland fishery) in Andalucía, resulting in an insufficient legal framework for managing this relevant activity. There are no official catch records, monitoring of the fishing activity or any biological sampling strategy in place. Under these conditions no scientific advice or recommendations can be made. There are no management objectives for the fishery and almost no management measures in place. Catches, discards and bycatch are not officially recorded, and there is no monitoring of bycatch, including possible interactions with PET species. The magnitude of IUU fishing cannot be evaluated. There is no specific professional license for this type of fishery and fishers are insufficiently organized. The red swamp crawfish fishery in the Guadalquivir Delta and its marshes constitutes a paradigmatic example of a longstanding case wherein the introduction of the non-native species occurred prior to the existence of guidelines and regulations on introduction of exotic species into new locations. It has been a long time since the introduction in this region is irreversible. The stock unit is not defined; to date there is only information about the geographical distribution of the species in the Iberian Peninsula (Global Invasive Species Database 2014). The entity responsible for managing the fishery (Junta de Andalucía) has never conducted (or commissioned) a stock assessment for P. clarkii in Andalusia. Only an isolated study estimated crawfish density; CPUE (capture per unit effort) were much lower in May (always below 500g per pot per day) when water level in the rice fields is low, than in August (one third of the fields over 500g per pot per day) showing the influence of the hydrological variability characteristic of the rice fields in the population dynamics of red swamp crawfish (Martínez et al. 1999). Although Spain is one of the biggest producers of red swamp crawfish, this species has not been regarded as a fishery resource by managers and scientists so far. Therefore, there are no official catch records, monitoring of the fishing activity or any biological sampling programme in place. Under these conditions no scientific advice or recommendations can be made for managing the fishery. There are no management objectives, catch limits or legal minimum size, as this species has been considered exclusively as an invasive species and the only objective recognized by managers has been its eradication since its introduction 40 years ago or, at least, deter its expansion into new areas. Therefore, the only scientific advice provided to the managers in relation to this species has always been linked to eradicate it or deter its expansion. The fishery is now restricted to a clearly delimitated area with a particular ecosystem (rice fields in the Guadalquivir marshes) where the presence of this species dates back to mid-70s and its eradication is not considered as a viable alternative. As stated above, there are no official catch records, monitoring or biological sampling programme in place for this fishery. Therefore, no reference points or any other objective at a managerial level are set for this fishery. Data on P. clarkii abundance do not exist (Tablado et al. 2010), and the status of the stock is currently unknown. Nevertheless, it is accepted that the population of P. clarkii is healthy and especially abundant in the southern part of the Iberian Peninsula (Gutiérrez-Yurrita et al. 1999). Estimations of the red swamp crawfish load capacity for the Guadalquivir marshes are around 1,100 Kg/Ha (Gallego & Ocete 1984 in Cano & Ocete 1994), matching similar load capacities calculated for this species in rice fields in Louisiana. According to Cano & Ocete (1994), between 1985 and 1992 the red crawfish load capacity for the whole cultivated rice area during that period ranged from almost 30,000 tons to 40,000 tons, depending on the hectares of cultivated rice. These estimations are almost 10 times more than current catches (3,000 tons in 2013, according to the processors’ association), so it is likely that total biomass of red swamp crawfish in the area is more dependent on the area of cultivated rice and the hydric regime of the fields than on the fishery’s removals. Procambarus clarkii is undoubtedly a good example of a large, prolific and aggressive species, well adapted to life in areas with strong seasonal fluctuations in the level of shallow waters, where it digs burrows (Huner and Barr 1984). Since its introduction in the Guadalquivir marshes 40 years ago, this species has shown an enormous capacity to adapt to the local ecosystems, proliferating and invading the whole area of rice fields and marshes (Cano & Ocete 1997, Gutierrez-Yurrita et al. 1999). Its reproduction is spread over a wide period of the year: in spring (coinciding with the flooding of the rice fields), mid-end of summer and end of autumn-winter (when flooding depends upon rainfall) (Cano & Ocete 2000). There are no studies on population trends and historical landings could be the only indirect estimation of current status of the stock; nevertheless some authors suggest that catches may be more related to the area of cultivated rice and the hydric regime of the fields than to the status of the stock (Cano & Ocete 1994, Martínez et al. 1999). As there is no obligation to report catches to the Administration, no official catches data were found, although the processing plants have detailed records which include traceability back to areas and providers (fishers), as most of their production targets foreign markets. No information is available to evaluate any trend in total biomass, spawning biomass or recruitment; nevertheless its spatial distribution and abundance is increasing in many European areas (Global Invasive Species Database 2014). When red swamp crawfish was introduced in Andalusia in the 1970s, no impact studies were conducted or control measures established. Since then, national measures to prevent the introduction of non-native species have been adopted as international awareness has increased of the issue. In this regard, in 1993, Spain ratified the Convention on Biological Diversity, a United Nations multilateral treaty for the conservation and sustainable use of biological diversity. Moreover, since 1995 the unauthorized introduction of non-native species is illegal (Ley orgánica 10/1995), and the Spanish law of Natural Heritage and Biodiversity (Ley 42/2007) prohibits the introduction of non-native species when they are liable to compete with native species or alter the ecological equilibrium. However, commercially fished Procambarus clarkii is listed in the first Spanish Catalog of Exotic Invasive Species as excluded from its application, as its fishery and trade is permitted and regulated as a resource for the seafood industry (Real Decreto 630/2013, Disposición adicional quinta). The stock is not managed through quotas or TACs. There is no institution responsible for taking official catch records or performing any kind of monitoring or biological sampling. Therefore, there are no specific scientific recommendations or advice to follow to manage the fishery. In general, there are no time restrictions (seasonal closures) for the fishery, although fishing is concentrated between July and October-November, as it is closely linked to the rice farming irrigation cycle. As an exception and specific spatial measure, a seasonal closure is established between April 15 and September 15 in the Paraje Natural Brazo del Este (area surrounding the Doñana National Park in the Guadalquivir Delta) and has in general been respected by the fishers – although occasional poaching has been detected -, and has resulted in a considerable decrease of bycatch in the fishery (Montes 2001). Most of the fishing takes place in modified water courses and rice fields in the marsh (Gutiérrez-Yurrita et al. 1999 in Martínez et al. 2001). The only authorised fishing gears are fyke nets: “nasa cangrejera” and “nasa holandesa” (Junta de Andalucía 2011). The regional Environmental and Spatial Planning Authority issued a new Order in 2014 restricting this fishery to the marshes belonging to the following municipalities: Almonte, Hinojos, Aznalcazar, Villamanrique de la Condesa, Isla Mayor, La Puebla del Rio, Coria del Río, Los Palacios y Villafranca, Utrera, Las Cabezas, Lebrija, Trebujena and Sanlúcar de Barrameda (Junta de Andalucía 2014). While in the remaining Andalusian territory no red swamp crawfish fishing is allowed, and only actions for its eradication as provided by regulations may be authorised (Junta de Andalucía 2014, Magrama 2013). So far, the main concern when managing the red swamp crawfish (the species, not its fishery) was to deter any possible expansion of this species into new areas. Therefore, the objective of the Order issued in 2014 by the regional Environmental and Spatial Planning Authority is to establish a clearly defined geographical delimitation for the red crawfish fishery, discouraging any viable exploitation in the remaining areas and deterring its expansion into new areas. However, this Order specifically states that it does not regulate the red swamp crawfish professional fishery. Decree 141/2013 (Junta de Andalucía 2013) establishes that professional fishing is under the jurisdiction of the regional Agriculture, Fishing and Rural Development Authority, whereas Decree 142/2013 (Junta de Andalucía 2013b) establishes that inland recreational fishing is under the jurisdiction of the regional Environment and Spatial Planning Authority. According to the new Order issued in 2014 the red swamp crawfish is a professional inland fishery, therefore, to date there is a legal vacuum when it comes to the regulation of this fishery, with a conflict of competences between two regional authorities (fishing and environment), resulting in an insufficient legal framework for managing this relevant activity. A set of measures on spatial regulation of the fishery are implemented and enforced in order to control the crawfish population within the Protected Area of Doñana and other surrounding protected areas (for more details see section on Marine Reserves). Since 1984 P. clarkii fishing is banned in the Doñana National Park and surroundings because of netting effects on birds (Anas platyrhynchos, Anas querquedula, Limosa limosa and Porphyrio porphyrio), amphibians (Pleurodeles waltl, Pelobates cultripes and Pelophylax ridibundus) and reptiles (Mauremys caspica and Blanus cinereus) (Molina-Vázquez 1984). The fishing traps are required to have a mechanism to avoid gaps in the mesh size bigger than 4 cm (Junta de Andalucía 1996), to block the accidental catch of other species. Since P. clarkii’s introduction in the Guadalquivir marshes, this species proliferated and invaded the whole area of rice fields and marshes (Cano & Ocete 1997, Gutierrez-Yurrita et al. 1999). According to Gallego & Ocete 1984 (in Cano & Ocete 1994) the load capacity for this species was reached during the period studied, and results from Cano & Ocete (1994) suggest that catches may be more related to the area of cultivated rice and the hydric regime of the fields than to the status of the stock. There is no evidence of any decrease in biomass within the fishing area which may suggest that a recovery plan is needed. A set of measures on spatial regulation of the fishery are implemented and enforced in order to minimize the impact and expansion of this species within the Protected Area of Doñana and other surrounding protected areas (for more details see section on Marine Reserves). The exploitation is not subject to TACs or quotas, and there is no minimum legal size or a maximum number of traps per fishermen or area. Neither fishers nor processing plants are forced to report catches to the Administration on a continuous basis. There is not a monitoring or official data for estimating IUU fishing, bycatch or discards. No published information was found about the magnitude of IUU fishing inside or outside of the management area from official and/or independent sources but the processing association (Pebagua 2014, pers. comm.) affirms there is no IUU fishing inside the management area. There is a threat of unregulated fishing happening within the protected areas, and in order to avoid this risk a set of measures on spatial regulation of the fishery are implemented and enforced (for more details see section on Marine Reserves). The authorities responsible for ensuring compliance with these regulations are agents belonging to the Environmental and Spatial Planning Regional Ministry and the SEPRONA (an environmental national police service). Violations to these rules are punished according to the disciplinary regime established in the Law 8/1999. However, within the fishing management area, no particular regional Ministry assumes the responsibility of invigilating the enforcement of those regulations specifically related to the fishing activity. The fishing traps are required to have a mechanism to avoid mesh gaps bigger than 4 cm (Junta de Andalucía 1996), to block the accidental catch of other species, nevertheless fishers compliance with this regulation is very low; a study done in 1998-1999 in the Bajo Guadalquivir area found that none of the checked traps had installed this blocking mechanism (Martínez et al. 1999). At the beginning of the 2000s agents from the regional ministry of Environment were undertaking inspections of the traps before they were set at the beginning of the season (Alfocan and Seafood Sevilla, personal communication). These inspections were performed for 3 years and consisted in checking and marking the traps with a tag including owner’s information. At that time a number of sanctions were imposed and some illegal traps were removed (Alfocan 2014, pers. comm.). However, at some point this practice stopped and it is not currently occurring. In the Guadalquivir estuary marshes there are several species included in international recognized lists (IUCN, CITES), and national and regional legislation. It is known that in the Guadalquivir marshes the netting of red swamp crawfish has inadvertently caused the death of of amphibians (Gutierrez-Yurrita et al. 1995, in ISSG 2013), fish (including eels) (Montes 2001), and aquatic birds (Molina-Vazquez 1984, Martínez 1999). So far no information on interaction with ETP species is recorded, and no specific programme is in place to monitor the incidence of the fishery on ETP species. Therefore, it would be advisable to develop a monitoring and management strategy to avoid and record any bycatch, including interaction with ETP species. The different spatial restrictions to the P. clarkii fishery in place have been introduced to reduce the ecological impacts of the fishery and deter any further spreading of this species. These measures are described in the section on Marine Reserves. The main concern regarding ETP species comes from the target species itself, not from the fishery, as the red swamp crawfish P. clarkii is known to have contributed to the decline of the local European crawfish (Austropotamobius pallipes) in other regions, because P. clarkii outcompetes the local species and acts as a vector for the transmission of the crawfish fungus plague, Aphanomyces astaci. European crawfish is not currently distributed within the authorized fishing area, and some authors (Alcorlo et al., 2008) affirm that no natural populations of white-clawed crawfish have ever existed within the Bajo Guadalquivir Region (the current red swamp crawfish management fishery area). A lot of effort has been made to deter further expansion of P. clarkii into new areas. The import of live crawfish from abroad is banned by customs legislation in some European countries and translocation to areas that have not yet been invaded is banned throughout the Spanish territory (Ley 42 2007; Real Decreto 630 2013). In Andalusia, a special authorisation is given by the regional Administration to the processing companies specifying the names of the fishermen authorised to transport the crawfish from the fishing area to the processing plant. Different mechanical methods have been tried in order to prevent further spreading of this species, including the use of traps, fyke and seine nets, drainage of ponds, the diversion of rivers and the construction of electrical barriers (Smart et al. 2002, Kerby et al. 2005, both in Global Invasive Species Database 2013). During the 1980s, 90% loss of the rivers occupied by native crawfish Austropotamobius pallipes in southeast Spain was observed, and nowadays they only inhabit isolated and remote headwater areas where P. clarkii is absent because of ecological barriers (Gil-Sánchez & Alba-Tercedor 2006). On the other hand it is important to remark that despite white-clawed crawfish (Austropotamobius pallipes) being commonly known as “the native crawfish”, there is evidence that it was also introduced to Spain in the 18th century, probably from northern Italy, and that there were no other crawfish species in historical times in the Iberian Peninsula before then (Clavero 2013). Some authors argue that the natural origin of Spanish white-clawed crawfish populations cannot be ruled out, but their anthropogenic introduction remains the most accepted hypothesis (Chiesa et al. 2011 in Clavero 2013). Regardless of the scientific discussion about A. pallipes’s native or introduced status in Spain, this species is considered native and under protection for the Andalusian and Spanish governments and considered as endangered (code A2ce) under the IUCN Red List of Threatened Species, vulnerable in the Catálogo Español de Especies Amenazadas and in danger of extinction in Andalucía and several other Spanish areas (Alonso 2012). Finally, declines in abundance of native amphibians (e.g. the natterjack toad Epidalea calamita in Doñana National Park), and invertebrates (native snails) have also been linked to the expansion of P. clarkii on the Iberian Peninsula (Cruz et al. 2006, Gherardi & Acquistapace 2007). E. calamita is included in Annex IV (animal and plant species of community interest in need of strict protection) in Council Directive 92/43/EEC on the conservation of natural habitats and of wild fauna and flora. On the IUCN Red List it is classified as a Least Concern species. The only target species in the fishery is P. clarkii. The netting of red swamp crawfish inadvertently caused the death of of amphibians (Gutierrez-Yurrita et al. 1995 in Global Invasive Species Database 2013), fish (Montes 2001), and aquatic birds (Molina-Vazquez 1984, Martínez et al. 1999), and the fishery has been considered a risk for the aquatic fauna that shares the habitat with the crawfish since the nets used had a low selectivity (Montes 2001). However, it must be taken into consideration that most of these studies have been developed in protected areas and not in rice fields where most of the fishing happens. Nevertheless other authors consider that the bycatch found (amphibians, fishes and aquatic birds) is very low, between 0.01-0.79 individuals captures per trap per week, although all animals captured were dead (Martínez et al. 1999). P. clarkii fishing was first banned in Parque Nacional de Doñana and surroundings in 1984 because of the netting effects on birds (Anas platyrhynchos, Anas querquedula, Limosa limosa and Porphyrio porphyrio), amphibians (Pleurodeles waltl, Pelobates cultripes and Pelophylax ridibundus) and reptiles (Mauremys caspica and Blanus cinereus) (Molina-Vázquez 1984). Also, to mitigate bycatch in a protected area called Brazo del Este (surroundings of the National Park of Doñana) the regional ministry of Environment issued an Order in 1996 (Junta de Andalucía 1996) including several measures such as: a seasonal closure (between April 15th and Septembre 15th), recommendations on how to set the traps (depth), a maximum number of traps in the area, a particular schedule when fishermen are allowed to check and empty their traps, and the obligation of installing a mechanism to ensure that no gaps larger than 4cm are left at the entrance of the trap. This mechanism installed by fishermen is very simple and it was later on declared compulsory for any kind of red swamp crawfish fishing trap in Andalucía (Junta de Andalucía 1999). According to the author these measures resulted in a considerably decrease of bycatch in the fishery (Montes 2011). So far no information on bycatch is recorded, and no specific programme is in place to monitor its incidence. The fishery administration has not established any target or reference points for bycatch. The regional Government (Junta de Andalucía) in collaboration with the Ecology Department of the University of Madrid and the support of one of the processing plants initiated a project to develop a fishery plan in order to evaluate, control and reduce the ecological impact of red swamp crawfish in the Lower Guadalquivir and natural protected areas of Doñana (Gheradi and Holdrich 1999, Montes 2001). However, this study could not be completed as the environmental disaster derived from the Aznalcollar mining residue spill changed the priorities and overwhelmed the capacity of stakeholders involved (Cobos 2014, pers. comm.). It would be desirable to resume a similar study linked to the red crawfish fishery. P. clarkii may inhabit a wide variety of freshwater habitats including rivers, streams, canals (EUNIS code C2), lakes, ponds, and seasonally flooded swamps and marshes (EUNIS code C3), apart from disturbed environments such as rice fields and irrigation channels and reservoirs (Oliveira & Fabião 1998 in ISSG 2013). This species is very tolerant and adaptable to a wide range of aquatic conditions including moderate salinity, low oxygen levels, dry periods and extreme temperatures (Cruz & Rebelo 2007, Gherardi & Panov 2006, NatureServe 2003 in Global Invasive Species Database 2013). Its presence in irrigation reservoirs, channels, and in rice fields poses a problem to rice culture. The galleries excavated by P. clarkii alter soil hydrology, causing water loss from reservoirs and rice ponds. Besides, at high crawfish densities the foraging may be so extensive as to modify the habitat destroying the microbial and the macrophyte beds (Gherardi & Acquistapace 2007, Lodge et al. 2012). Intense herbivory by P. clarkii may cause indirect impacts and cascading ecological changes, significantly altering the structure and function of the marsh. Reduction of aquatic vegetation results in many indirect effects as it serves as habitat for invertebrates, amphibians, and fry; as a substrate for epiphytic algae; source of refuge for prey, and a primary food source for several birds and other species (Nystrom 1999, France 1996 in Nystrom 1999, Steinman 1996 in Nystrom 1999, Global Invasive Species Database 2013). This reduction of macrophyte mass and biodiversity and has been recorded in the Iberian Peninsula (Rodriguez et al. 2003 in Cruz & Rebelo 2007). Taking into consideration all the issues mentioned above, the fishery may have a positive effect in the rice fields and marshes since it helps to regulate the abundance and spread of P. clarkii. On the other hand several studies have shown positive effects of P. clarkii on birds and other vertebrate predators (Tablado et al. 2009, Poulin et al. 2007, Rendón et al. 2008). 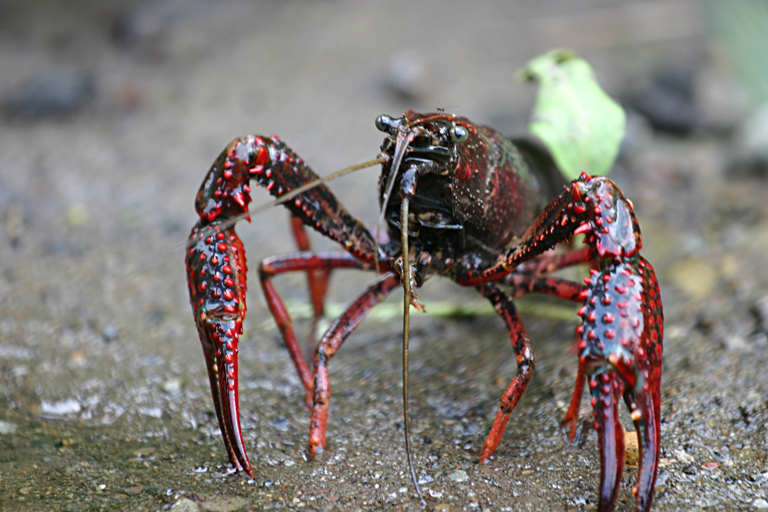 A study about the diet and population trends of several P. clarkii predators since its introduction showed that most predator species consumed red swamp crawfish (up to over 50% of their diet) and that the abundances of species preying on crawfish increased significantly in the area as opposed to the abundance of herbivores (Tablado et al. 2009). Moreover, the Guadalquivir marshes are inhabited by at least 10 predator species that are considered threatened in Europe and the fact that abundances of these predators are increasing because of the colonization of red swamp crawfish, makes it difficult to manage this invasive species that was known previously for its negative effects on invaded communities (Tablado et al. 2009). Nevertheless, the same authors consider that the trade-off between undesirable and desirable effects of crawfish establishment is a complex issue to evaluate as the increase in abundance of predators can also affect native species (Tablado et al. 2009). One of these undesirable effects could be the increase in abundance of a non-native fish species in the Guadalquivir marshes like the fish Micropterus salmoides, due to its positive interaction with the red swamp crawfish (Tablado et al. 2009) or the positive effect of P. clarkii on the population density of the invasive species American mink Neovison vison (Melero et al. 2014). (a) Year-round closed areas and seasonal/spawning closures, protection of EFH, etc. - No need for this kind of measures aiming to ensure the sustainability of the target species. - In the remaining Andalusian territory no red swamp crawfish fishing is allowed, and only actions for its eradication may be authorised as provided by regulations (Junta de Andalucía 2014, Magrama 2013). - The Paraje Natural Brazo del Este is a protected area in the surroundings of the Espacio Natural de Doñana. Since 1996 a seasonal closure is in place in this area between April 15th and September 15th in order to avoid marine bird bycatch in the traps (Junta de Andalucía 1996). Besides, other special regulations were imposed (see section 3.4.2). - A National and Natural park exists in the area of the Guadalquivir River basin; Parque Nacional de Doñana (since 1969) and Parque Natural de Doñana (since 1989 and extended in 1997). Although most of the fishing happens outside of the limits of these two protected areas, the regional ministry of Environment may issue specific fishing authorizations in order to control the red crawfish populations. In these cases the authorization may include specific conditions and must comply with Law 8/1999 (Junta de Andalucía 2914). As an example, in 2013 fishing was authorized in Caño Guadiamar, but the installation of traps was banned nearby the bird colonies during the breading season (Memoria Doñana 2013). - Besides, Andalucía has a wide representation of natural areas within the Natura 2000 network, with 2.6 million Ha included (almost 7% of those Ha are wetlands). In the fishery management area and its surroundings there are several areas included in the Natura 2000 network. There are no official catch records, monitoring of the fishing activity or any biological sampling strategy in place. Under these conditions no scientific advice or recommendations can be made for managing the fishery. No impact studies were conducted at the time of the introduction of red swamp crawfish in Andalusia in the 1970s but this occurred prior to the 1993 Convention on Biological Diversity which included provisions on the subject. There are no management objectives set to ensure optimum productivity of the species, despite the existence of a general strategy to permit fishing within a limited region and deterrence of its expansion, including protection of adjacent highly valuable habitats. There are no biomass estimates (or equivalent) from stock assessments and no biological reference points set. Data on P. clarkii abundance does not exist (Tablado et al. 2010), and the status of the stock is currently unknown, nevertheless it is known that P. clarkii is quite common throughout the Iberian Peninsula and especially abundant in its southern half (Gutiérrez-Yurrita et al. 1999) and its spatial distribution and abundance is increasing in many European areas (DAISIE 2014). Some studies suggest that catch variations may be more related to the area of cultivated rice and the hydric regime of the fields than to the status of the stock (Cano & Ocete 1994). A study determined the load capacity of red swamp crawfish in the Guadalquivir marshes and rice fields at 1,100 kg/ha, which is much higher than current and historic catches (Gallego & Ocete 1984 in Cano & Ocete 1994). However, as stated above, there is a lack of specific monitoring and assessment for this fishery in this area. There are no fishing mortality reference points set for the stock and there are no estimates of current or historical fishing mortality. There are no signs or warnings of elevated fishing pressure by any scientific body or other stakeholders. A study suggest that the biomass of red swamp crawfish in the Guadalquivir marshes and rice fields during 1982-1987 was close to the load capacity for this species in this habitat (1,100 kg/ha), which is much higher than current and historic catches (Gallego & Ocete 1984 in Cano & Ocete 1994). However, as stated above, there is a lack of specific monitoring and assessment for this fishery in this area. Quantitative scores cannot be calculated because of the lack of numerical information relative to the fishery. Qualitative scores are given when possible. have been attributed to scores 1, 4 and 5 based on available information (please mouse over for justifications). Fishers’ compliance cannot be scored as the exploitation is not subject to TACs or quotas, and there is no minimum legal size or maximum number of traps per fishermen or area. Neither fishers nor processing plants are forced to report catches to the Administration on a continuous basis. A mandatory measure to reduce bycatch was met with low adoption in the past but no recent data is available. The major threats posed by IUU fishing are linked to the risk of spreading red swamp crawfish into new areas or promoting further increases of biomass in areas where it should be reduced or eradicated. To date there is a set of spatial measures implemented and enforced to avoid these risks. A public security body called SEPRONA (Service for the Protection of Nature of the Guardia Civil) is responsible for ensuring compliance with environmental regulations. However, no particular body assumes the responsibility of ensuring the enforcement of the fishing regulations. Catch data is not officially recorded – the time series shown is from Alcorlo et al (2008), and shows production statistics for the Guadalquivir region from 1976 to 2000. Values have been digitized from a bar chart and are approximations. Cynthia Fernández Díaz (cynthia@uvigo.es): Facultade de Ciencias do Mar, Campus Lagoas-Marcosende, Universidad de Vigo, 36210 Vigo (Pontevedra), Spain. Gonzalo Macho Rivero (gmacho@uvigo.es): Facultade de Ciencias do Mar, Campus Lagoas-Marcosende, Universidad de Vigo, 36210 Vigo (Pontevedra), Spain. José Ríos Giráldez (joserios@consultorpesquero.com): Palmás, 1º Domaio, 36957 Moaña (Pontevedra), Spain. Global Invasive Species Database. 2014. Procambarus clarkii. [Accessed 1st September 2014]http://www.issg.org/database/species/ecology.asp?si=608. Alcorlo P, Baltanás A, Bravo MA & Montes C. 2008. El cangrejo rojo americano en el sistema socio- ecológico de Doñana. Quercus 269, 34-41. Gutiérrez-Yurrita P, Martínez JM, Bravo-Utrera MA, Montes C, Ilhéu M & Bernardo J. 1999. The status of crayfish populations in Spain and Portugal. In Crayfish in Europe as alien species: how to make the best of a bad situation. Ed. AA Balkema, Rotterdam.